We thought you might like to learn a little more about the author himself while you wait for more of our thoughts on the subject, but before we do that, let me tell you guys a neat story. I spent quite a number of years being very intensely passionate about vertebrate Paleontology, which is what I originally set out to study. Incidentally, it was through this interest in Paleontology that I first came into contact with Sir Arthur Conan Doyle. I read and absolutely ADORED his Lost World. Of all the books I’ve read throughout my life, somehow that one has always stuck with me as having been one of the most memorable and strangely impacting things I’ve ever read. It was this inspiring impact that initially seeded a distant desire in me some 12 or 15 years ago to read any of Conan Doyle’s other works. (Remember those last two sentences, they’re important.) At that particular point in time, however, my mind could hardly have been further from the world of Sherlock Holmes. All of my energy was focused on things paleontological, and part of that process involved spending a little under five years working at a local museum. While working at said museum I chanced to meet a fellow paleo-enthusiast and avid reader by the name of – wait for it – Martin Powell. Martin and I worked together at this museum for a couple of years and in that time became good friends. I had no ties to Sherlock Holmes, and Martin never really made any mention of being an author, so Doyle never really came up between us. What we DID do was spend quite a lot of time sharing a mutual love for anything that had any resemblance at all with this Lost World-like atmosphere, along with all of its variants, and somehow that made a huge impact in my world at the time too. Eventually my life moved on, however, and I had to leave my job at the museum (one of the saddest days of my life, really), which unfortunately also meant that Martin and I went our separate ways. We never saw each other again after I left work for the last time about ten years ago and completely lost touch. I never forgot the interactions we had, though, and found myself wondering now and again what ever had became of him. Now, imagine how struck I was to open up a randomly-chosen book one day this last fall to find, of all things, a short piece of Sherlockian pastiche titled Sherlock Holmes in the Lost World. The title instantly rang home like a bell. I hadn’t even thought about Lost World for ages, and yet suddenly all (and I mean ALL) of the corresponding memory came flooding back creating – within seconds – a fundamentally disorienting bridge between two very radically different, but very intense chapters of my life. I really needed to know what this story was, so I flipped to the appropriate page and was then even MORE disoriented and confused to find a name there that I recognized. I initially wrote it off as total coincidence – so improbable seemed this weird overlap of life-paths – and ended up hesitantly shutting the book after mumbling something to my boyfriend to the effect of “I had a friend by that name once…”, but then stopped just short of putting the book back on the shelf. “Wait,” I said out loud as the title and theme of the story sunk in, “That…That could ACTUALLY be the same guy!” My boyfriend had to physically pull me away from the shelf just then to keep me from buying up the book right then and there (I’m pitifully poor just now), but that didn’t stop me from looking the thing up right away when we got home. Lo and behold, it really WAS the same ‘Martin Powell’! BAM! Just like that, we’d stumbled into each other’s paths again after ten full years of complete and total disconnect. I think Martin was just as disoriented to hear from me out of the blue as I was to see his name inside of a book of Sherlockian pastiche. I never knew Martin had connections to anything Sherlockian when I worked with him, and at the time would never have anticipated that I might develop a solid interest in it myself, and NEITHER of us could ever have anticipated that we might bump into each other again after such a long period simply because he once chose to have some fun with two Doylean works, and because I then just happened to pick up the right book at the right time and open it up to the right page to see a title that grabbed my attention. It really is curious how life sometimes winds itself around into interlocking circles like that, but I’ve been very happy for this one, because Martin has been a very good friend to me in the months since we’ve re-connected. We still shake our heads at it, though. Crossovers Casebook (SH in the Lost World) → This is the book that brought us together again earlier this fall. Hound of the Baskervilles classic graphic novel (Sequential Pulp/Dark Horse Comics. Martin Powell’s Sherlock Holmes/Count Dracula graphic novel, SCARLET IN GASLIGHT, which received a coveted Eisner Award nomination when first published, is currently in its seventh printing. He has since written hundreds of stories in numerous genres, including mystery, science fiction, horror, and humor, and has been published by Disney, Marvel, DC, Moonstone, Wild Cat Books, and Sequential Pulp/Dark Horse Comics, among others, working with such popular characters as Superman, Batman, Popeye, Tarzan, Lee Falk’s The Phantom, Frankenstein, The Spider, Kolchak the Night Stalker, The Avenger, and more. Powell is also a prolific author of many acclaimed children’s books, and is the creator of THE HALLOWEEN LEGION. His THE TALL TALE OF PAUL BUNYAN won the coveted Moonbeam Children’s Book Award for Best Graphic Novel of 2010. He lives in Saint Paul, MN. Basically, Martin’s a pretty darn cool guy to know. So, when you’re done reading this, feel free to go check out his blog, his public Facebook page, his Amazon profile page, or follow him on Twitter (@MartinPowell221). He’s a very good, refreshingly non-assholish guy, I promise. But that’s enough of my own prattling – On to the questions! SP: What moved you to want to become a professional writer? POWELL: Something weird and twisted inside my skull, most likely. When I was in the second grade I started writing and drawing my own comics. The first comic book I remember making was a Winnie the Pooh story, all in crayon, during the Christmas holidays. I wrote and drew some Popeye the Sailor adventures, too. I always loved to read and discovered I liked telling tales even more. When I was in high school, I read a science fiction story by Richard Matheson called “Born of Man and Woman”, a very short tale of only a few pages and I was struck by its emotional intensity. It was a life defining moment and I remember thinking to myself, “I want to learn to do that!” And I’d pretty much made up my mind at that point. So, for the next five years, week upon week, month after month, mopping department store floors at night while attending a few Science, English, and Art classes, I practiced writing. I was also going to theatrical auditions during the daytime hours, since I was also a working actor and stage magician at that time. Seems I’ve always been going in a dozen different dizzy directions at the same time, but writing was my major obsession. I typed my fingers raw without so much as a nibble of interest from any editor I ever contacted. My family and friends had begun to think that there was something very wrong with me. And, worse…I almost started to think so, too. Fortunately I managed to meet Ray Bradbury at that time and, amazingly, we became friends. I was in awe of Ray, of course, and the fact that he believed in me made all the difference. He never doubted that I would make it someday, so somehow I rarely doubted it either, and when I did he set me straight. As a friend, mentor, and spiritual father, I owe him more than I can ever say or repay. My first professional sale was a story called “The Dinosaur Doctor”, which was inspired by a visit to a museum where I had seen a Mesozoic insect fossilized in amber. Although it was over 150 million years old, the insect looked very much like a modern horsefly. I remember being dazzled by the notion that this prehistoric fly had very likely touched and tormented the dinosaurs, much as swarms of similar insects do to animals today. That fly might even have sucked dinosaur blood. Suddenly, this story popped in my head. What if a scientist was able to extract the dinosaur blood from the stomach of the insect, and reproduce the saurian DNA in order to resurrect a herd of the extinct animals? Mind you, this was a number of years beforeMichael Crichton’s JURASSIC PARK was published. So, I was there first…even if my story wasn’t nearly as good as his. Hah. SP: Can you tell us what drew you into writing SCARLET IN GASLIGHT? POWELL: I felt compelled to write it. Partly out of frustration, but also because I’m such a Sherlock Holmes fan. I was very disappointed with two previous novels from other writers, both of which I couldn’t even finish reading, that dealt with a similar theme. In both books I felt Holmes behaved completely out of character, becoming an instant expert vampire hunter. I figured that in no way would Sherlock Holmes be prepared for a genuine supernatural encounter. He always made it very clear that he didn’t believe in such nonsense. Then, I asked myself, well…what if he’s wrong? After all, he didn’t know everything. Coming face to face with a genuine vampire would conflict and challenge everything Holmes believed in. His great mind would collapse upon itself and immediately Holmes would be utterly out of his league, with the odds terribly against him. I liked the idea of Dr. Watson and Mycroft Holmes taking charge for a while. Toss Professor Moriarty in the mix, too, and quite suddenly, I had what I hoped was an epic adventure. SP: You made a bold move by choosing to have Holmes cross paths with Dracula and clearly it’s gone over really well, but have you had anyone come forward to really dig in and criticize it? I can see some, more purist Sherlockians tensing up at something like this. POWELL: I was scared to death something like that might happen, but I’m very lucky that the book has always been so well received. Surprisingly, even Leslie Klinger praised it in his ANNOTATED SHERLOCK HOLMES, which has helped me gain a new audience. Still, no one has been more surprised than me that the book has remained in print all this time. 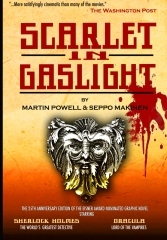 SCARLET IN GASLIGHT was authorized by Sir Arthur Conan Doyle’s estate, by the way, as was my second Sherlock Holmes adventure, A CASE OF BLIND FEAR. That possibly had a positive influence on the fans, too. SP:Do you agree with the assertion that Holmes is a ‘proper drug addict’? POWELL: Oh, absolutely not. Holmes took a seven per cent solution of cocaine only during periods when his restless mind was becoming stagnant. The drug was quite legal and easy to obtain during the Victorian Era, but it’s actually hardly mentioned in the entire Canon. Part of the thing about Sherlock Holmes that makes him so fascinating is the fact that danger always excited him, but he was positively terrified of boredom. To call Holmes a drug addict is just as ludicrous as referring to someone who has a few drinks on the weekend after a hard week at work as an alcoholic. Idleness and boredom were pure poison to him. I’ve always suspected that Sherlock Holmes was, at least, a mild manic depressive. Plus, he was a sort of a super-man – an expert boxer, swordsman, champion-level runner, and strong enough to unbend twisted iron fireplace pokers. I suspect he was something of a savant, too. While in his own element Holmes is master, but in common social situations he’s almost tragically out of place and extremely uncomfortable. Then there are his pronounced problems with women. I don’t personally feel that Sherlock Holmes disliked females, merely that he distrusted them. No doubt he had his reasons. During all his life there appears to have been only one woman who possibly touched his heart and inspired him – and even she was an adversary. The Great Detective’s greatest mystery of all was himself. SP: Would you agree with the notion that Holmes and Watson can be considered ‘role models’? POWELL: Certainly! Intellectual reasoning and loyal friendship are very solid foundations for role models. SP: Do you think Sir Arthur Conan Doyle would be pleased to see his works continue to gather such a following, or do you think he’d be irritated? POWELL: Very interesting question. When I spoke to Conan Doyle’s daughter several years ago, she told me that her father was always rather bewildered by the popularity of Sherlock Holmes. At times it threatened to totally dominate him, which he resented. He was a very complex man. Later on in his life Sir Arthur’s interests focused on the occult and spiritualism and he seemed to consider all of his fiction as rather unimportant. Even so, I suspect he’d find it astonishing and wonderful that this great unwanted child of his imagination is still as famous as ever. SP:How about some commentary on your crossover story “Sherlock Holmes in the Lost World”? This is an especially interesting sort of crossover. 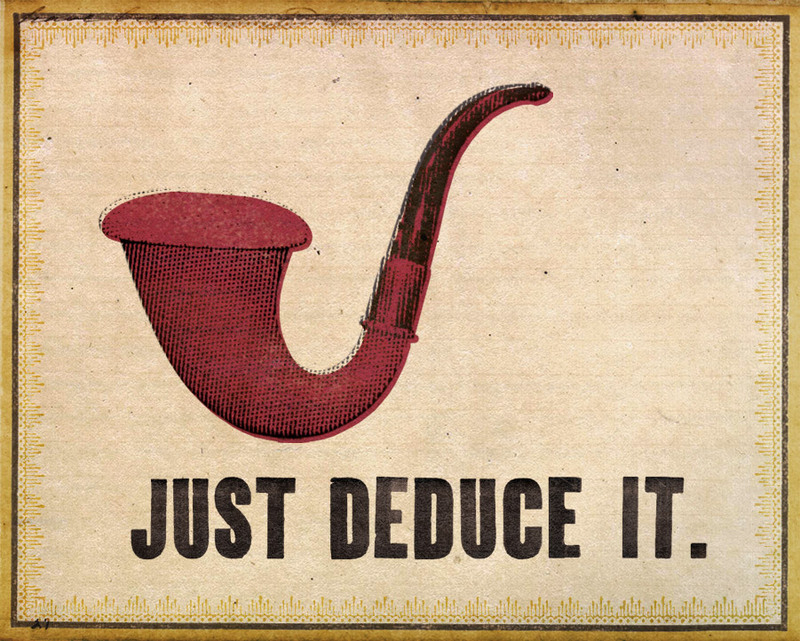 What made you decide to combine one Conan Doyle creation with another? It’s been a dreadfully long time since I’ve read the original LOST WORLD, but you write little details in to many of the characters that seem to fill a few ‘gaps’. How did you go about doing that? 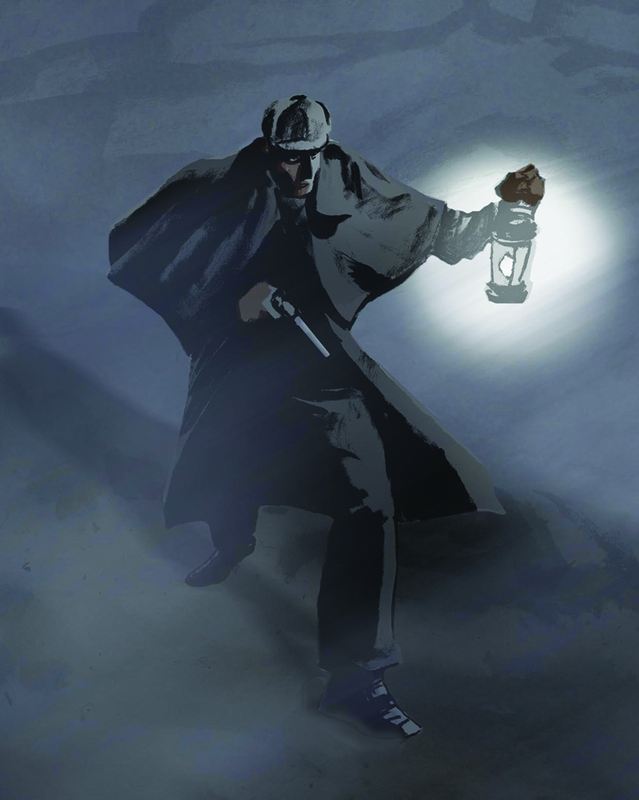 POWELL: I’d been thinking about it for years when a Canadian publisher invited me to be a part of a new prose anthology called GASLIGHT GRIMORE, which would focus on weird never before told adventures of Sherlock Holmes. I remember that they purchased the story instantly upon learning of my title alone. I had a cameo with Professor Challenger in my A CASE OF BLIND FEAR, which was a lot of fun to write, and I wanted an excuse to use him again opposite Holmes. The tale just grew from that. Also, I was anxious to do this one because it was a prose piece. I’d come to discover that many Sherlockians don’t read graphic novels, which perplexes me, and I was determined to show that I could successfully write a prose Sherlock Holmes adventure. The anthology went on to make the short list for the Canadian Prix Aurora Award for the Best Work in English in the speculative fiction genre, and “Sherlock Holmes in the Lost World” was also reprinted in a somewhat longer version by another publisher in SHERLOCK HOLMES: The Crossovers Casebook just last year. It’s probably my favorite of my own tales of the Great Detective, and I suspect it still has some life in it yet. 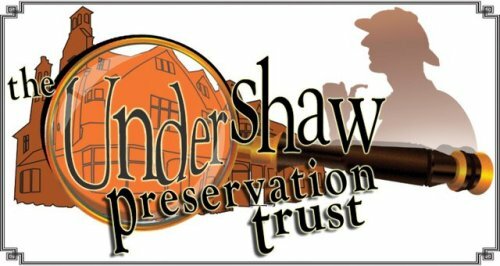 SP: What can you tell us about your new graphic novel of THE HOUND OF THE BASKERVILLES? What’s been changed? What can readers expect? POWELL: Well, this the first Sherlock Holmes story I’ve ever adapted, all the others have been original adventures. It’s being published by Sequential Pulp Comics, a new specialty imprint of Dark Horse Comics, whose focus is adapting the works of classic pulp fiction into comics for the new millennium. I pitched the concept of the book right away, since it’s probably the most famous detective mystery ever written and, ironically, few people today have actually read it. 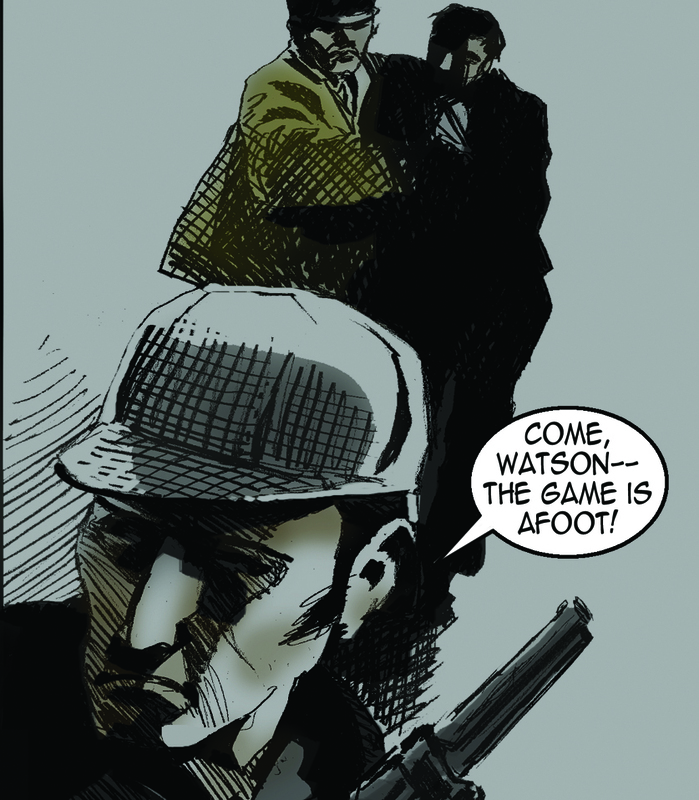 I thought, perhaps, a snazzy new graphic novel might lure new readers back to the original classic Sherlock Holmes books. Working with illustrator Jamie Chase, we sought to create the definitive version of the Great Detective in comics. Our version of THE HOUND is as authentic as we could make it, but that doesn’t mean that there isn’t a surprise or two lurking in its atmospheric pages. Already there’s been some very exciting early critical praise for the book, so I’m encouraged that we succeeded in our mission. SP:What are your thoughts on ‘Elementary’? POWELL: Afraid I haven’t seen it. I really don’t watch TV. SP:An awful lot of people who might not otherwise have thought to do so are now taking an interest in writing and publishing things like Sherlockian pastiche. Bookstores and the web are rampant with them in all sizes and colors. Can you offer any advice for aspiring writers, ‘professional’ (i.e. as a career move) or otherwise? What can or should someone who’s interested in publishing their work do? What should one avoid? POWELL:If you want to be a writer you need to write every day. There’s just no other way around it. Write about what you know and what interests you. Try to challenge yourself. Don’t write because you think you’ll get rich and famous. Write because you want to tell good stories. New writers should focus on short stories rather than novels. You could spend a year or more writing a novel and it may turn out badly. Learning to write a good, solid short story is much more instructive and you feel an immediate accomplishment once it’s completed. This business is ripe with rejection, so you must be brave. Consider criticism carefully, and only then reject it, if you feel you must. Follow your own dreams. When people say you’re wasting your time, ignore them. Those people are not your friends. Never give up. If you do then you never wanted it badly enough. So there you have it! A little bit of insight into the mind of Mr. Martin Powell! Thank you very much for taking the time to speak with us, Martin, and we hope that the rest of you have enjoyed reading this! This entry was posted in Good Company.